As one of Canada’s top tourist attractions, Whistler welcomes more than two million visitors per year. Put that with its population of nearly ten thousand and that is a lot of traffic. You can rely on our Whistler Graffiti Removal to help put your best foot forward for visitors or friends. Our experts understand the importance of this historical landmark and are proud to be part of its preservation. Keep the exterior of your space clean and welcoming with our Whistler graffiti removal Services. In recent years there has been a rise in street art throughout large cities and tourist spots. The trend took off with Pioneer graffiti artists such as Shep Fairley, Jean-Michel Basquait and as recently as Banksy. This trend has trickled down and become a status symbol for those who want to leave their mark. This is a pain for property owners, but agonize no longer! The Gorillas are here to help. Whistler residents may call and request routine service calls (weekly or bi-weekly are most common). 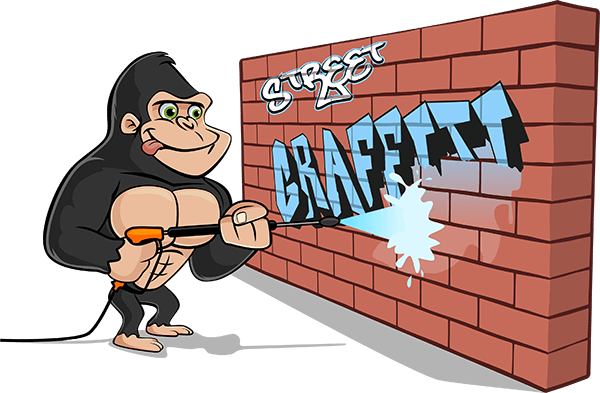 One call has our Gorillas swinging by for your Whistler graffiti removal magic. Graffiti or ‘tags’ are not only limited to larger properties and public areas (our gondolas are a popular spot to leave a mark) but residential areas as well, with garage doors and bare exterior walls being a blank canvas for vandalism. Our Graffiti Removal Service is carried out in the style most appropriate for the job at hand, as each tag will be different in surface application and materials used. We are able to carry out the Graffiti Removal with eco-friendly cleaning agents, power washing or colour-matching and repainting the affected area. Visitors and residence alike should note that apart from the unwanted art that warrants Graffiti Removal, there is an artistic side to this Graffiti culture in Whistler. While in the area, visit Train Wreck Trail, it is the site of a train crash dating back to 1957 in which seven cars were derailed near the Cheakamus River, which has since been converted into a hiking trail, bike path and unofficial art gallery. Let us handle your Graffiti Removal, while you hit the trails!